On Saturday, May 23, almost 300,000 people took to the streets in San Salvador to celebrate the beatification of Oscar Romero, thirty-five years after the archbishop was assassinated at the start of El Salvador’s civil war. The celebration of his martyrdom—for it has been celebrated by the leftist social movement long before its recognition by Pope Francis—as well as the fierce opposition to his sanctification from within El Salvador, illustrate the deep divisions in this small Central American country that endure nearly twenty-five years after the end of its civil war. 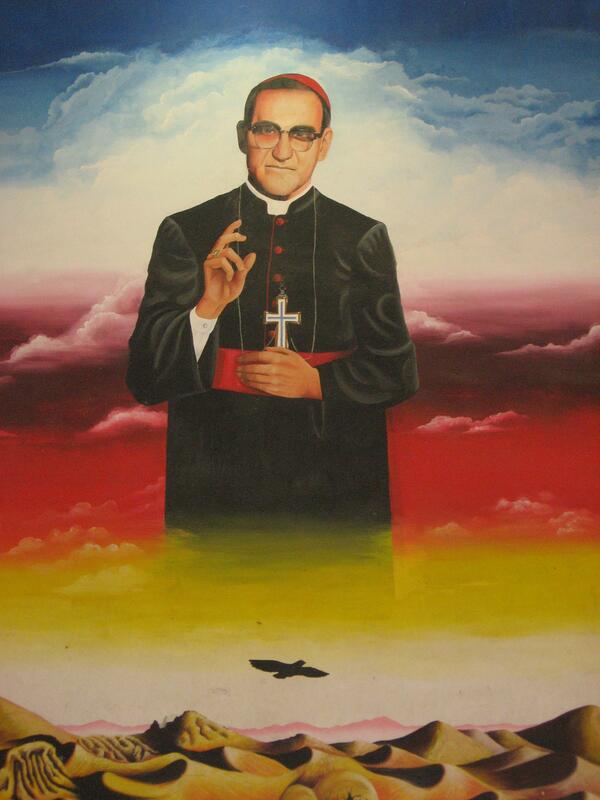 With beatification, the final step before sainthood in the Catholic Church, the Vatican validates the view of Archbishop Romero as a martyr whose advocacy for the poor was impelled by faith, not ideology. This is a reversal of the stance of the Church hierarchy during the war and a slap in the face to conservative factions who view Romero as a political subversive who used the pulpit to promote Marxist ideology. Roughly half of El Salvador’s population today is under the age of 25 and was not alive when Romero was killed, or during most of the war. In their lifetime, the FMLN (Farabundo Martí National Liberation Front, the former guerilla forces), has been a political party that won the presidency in 2009, unseating Alianza Republicana Nacionalista (ARENA), the right-wing party that had been in power for the past 20 years. But intense ideological polarization remains, largely revolving around the place of the poor in economic and political life. Today, high rates of criminal violence and emigration, both legacies of the war and reminders of enduring social inequality, challenge efforts to promote democratic citizenship in El Salvador. How do young people coming of age in the postwar era make sense of these realities and develop their civic identities in the midst of national divisions and transnational migration? In many ways, these two schools resided in two El Salvadors (COHA 2014), their students exposed to starkly different realities and different versions of national history. In the tradition of critical ethnography in education, I sought to understand what kinds of social identities for students were produced in and by their schooling, and how their civic socialization was influenced by transnational migration. In particular, I was interested in how participation in transnational networks shaped students’ thinking about inequalities in their own society, and what kinds of civic identities it forms? Both of these schools were enmeshed in transnational communities, with multiple ties to the United States, and students in both schools, I learned, were deeply aware of and influenced by the Salvadoran diaspora. As I engaged students in reflective discussions about national and civic identity, there emerged a remarkable convergence in the narrations of “being Salvadoran” of students from both schools, which I trace to their experiences in the diaspora. In an article published in the Journal of Latin American and Caribbean Anthropology (Dyrness 2014), I argue that both of these schools reproduced national divisions by socializing students into separate class and political identities. At the same time, I show that students’ participation in transnational networks disrupts the seamless reproduction of dominant class-based identities, occasioning a moment of critical reflection that has the potential to counter local arrangements of power. I suggest that students’ knowledge of and experience in the Salvadoran diaspora offers Salvadoran educators a unique opportunity for a civic rapprochement between the social classes. This is not to minimize the deep divides between the classes or the differing experiences of students in each school (of which I’ll give examples below). It is, rather, to suggest that students’ socialization in the diaspora challenges some of their socialization at home, in ways that are potentially transformative. The views of Oscar Romero at both schools offer a case in contrasts and a glimpse into the distinct group identities each school promoted. At the Lincoln School, in the Salvadoran history class offered only in the senior year, the teacher announced one morning that he was going to show a movie on Oscar Romero. He said he was going to provide some background on Romero, but he had barely begun when he was interrupted with a chorus of comments from students, both derisive and hostile. One female student blurted out loudly, “Why did he insert politics into religion? That’s what rubs me the wrong way.” Later, the same student asked, “It was never found out who killed him?” The teacher answered, “No.” I later asked the teacher privately, wasn’t it recognized that the one who ordered Romero’s assassination was Roberto D’Aubuisson, the founder of ARENA? (This had been the finding of the United Nations-sponsored Truth Commission.) The teacher said, “I would not dare to sustain that here.” A key piece of El Salvador’s history was withheld for fear of challenging students’ political identities. At the Lincoln School, my research found, even as students were encouraged to look abroad for future opportunities, they were protected from encounters with difference and inequality at home, reinforcing their collective identity as members of a privileged class. While gated security, privately chauffeured vehicles and armed body guards limited their interaction with people from different social class backgrounds, the selective omission of political issues from class discussion contributed to a culture of political intolerance in which the acceptable boundaries of political identity were strictly policed. In one informal exchange I observed, the Social Studies teacher and two students were discussing a recent ARENA campaign ad that listed all the people FMLN vice-presidential candidate Sanchez Ceren had killed during the war. The teacher remarked in disgust, “And on their side they have [Roberto] D’Aubbuison who created the death squads!” A female student added, “And ordered the killing of Monseñor Romero!” Informal exchanges such as this, as well as the formal ceremony honoring Monseñor Romero, solidified young people’s identity as part of el pueblo sufrido (the long-suffering people). While formal ceremonies constructed students as victims of injustice and agents of social change, other social processes within the school, including criminalizing disciplinary practices that “treat us like delinquents,” worked to position youth in El Rio as objects of law enforcement, surveillance, and control, reproducing the social identity of el pandillero, or gangster. These are some of the social practices that reproduced dominant social class and political identities for students in each of these two schools, contributing to class-based and political divisions in Salvadoran society. Yet students in both communities were also enmeshed in transnational networks that positioned them within global relations of inequality. Significantly, when asked to define themselves as Salvadoran citizens (“What does being Salvadoran mean to you?”), students in both schools made reference to the Salvadoran diaspora. Whether through personal experience abroad, contact with Salvadorans living abroad, or through U.S. movies and music, students in both schools showed a heightened awareness of how others outside of El Salvador view them as Salvadorans/Latinos, and incorporated this into their evolving civic identities. My findings suggest that this transnational experience—living in a transnational social field whether or not one has actually moved abroad (Levitt and Glick Schiller 2004)—has the potential to strengthen students’ civic identities: their sense of connection to and desire to contribute to El Salvador. This potential lies paradoxically in the unequal positioning of El Salvador relative to the United States and students’ awareness of the subjugation of Salvadoran culture, society, and identity within a transnational field. Although this awareness took different forms for students in the Lincoln School than for students in El Rio, students in both schools articulated a critique of U.S. society, including especially the discrimination against Salvadorans/Latinos, and a pride in El Salvador as un país sufrido (a long-suffering country). In my interviews with students, the awareness of hardship and discrimination faced by Latino immigrants in the United States was a recurring theme, even for the privileged Lincoln School students, for whom traveling to the United States gave many their first personal experience of discrimination and unjust treatment. While their experience arguably cannot compare to that of undocumented immigrants from El Rio, what is significant is the awareness, for students in both social groups, of the experience of inequality of Salvadorans in the United States, and the way this awareness figures in their civic imaginaries. Students’ experiences in the diaspora offered a new shared framework for citizenship because, on the one hand, the shared experience of subordination is a powerful force shaping collective identity (Gilroy 1987). The sense of being unfairly stereotyped, for many students in both schools, was a powerful motivator for constructing an alternative identity, a source of civic pride. At the same time, experiences in the diaspora make national identity salient in ways these students’ schools in El Salvador did not. Students from both schools made references to a shared history of the war, violence, earthquakes and other natural disasters, indicating a collective memory that included Salvadorans of all social backgrounds. So far as my extended observations could tell, very little in their schooling encouraged them to form this collective sense of ‘being Salvadoran’ with students from other social backgrounds, and in the case of the Lincoln School, much of their schooling actively discouraged it. Instead, this gesture towards national unity seems to have been prompted by students’ experiences in the diaspora. The experience of subordination in a transnational social field made students reflective about “being Salvadoran” and caused them to recall historical experiences that were inclusive of all Salvadorans as key to their identities. In the case of the privileged Lincoln School students, I argue that the critical reflection occasioned by their experiences in the United States allowed them what Paul Willis (1977) called “partial penetration” of the determining conditions of their existence (Dyrness 2014; Dyrness and Sepúlveda 2015). In the words of some students, the protective “bubble” was burst upon experiencing life in the diaspora; the conditions of their privilege suddenly called into question. In a different way for El Rio students, intimate knowledge of the life of undocumented immigrants gave them a greater consciousness of injustice, as well as pride and respect for Salvadorans who worked hard and struggled to get ahead in the face of adversity. These ‘civic imaginaries’ represent a tremendous untapped resource for Salvadoran educators who seek to inspire students to contribute to democratic social change in El Salvador. Discussions about the experience of Salvadorans in the diaspora could open up discussions about inequality at home, engaging students in a critical analysis of their own social realities. While educators at the Lincoln School feared such “political” conversations (Dyrness 2012), my findings suggest that students are ready and eager to have them. 1 All school names are pseudonyms. Dyrness, A. (2012). “‘Contra Viento y Marea (Against Wind and Tide)’: Building Civic Identity Among Children of Emigration in El Salvador.” Anthropology & Education Quarterly, Vol. 43, No. 1, March 2012. Dyrness, A. (2014). National divisions, transnational ties: Constructing social and civic identities in post-war El Salvador. Journal of Latin American and Caribbean Anthropology, 19(1), 63–83. Dyrness, A. and E. Sepúlveda (2015). “Education and the production of diasporic citizens in El Salvador.” Harvard Educational Review, Vol. 85, No. 1, pp. 108-131. Gilroy, P. (1987). “There ain’t no black in the Union Jack”: The cultural politics of race and nation. Chicago: University of Chicago Press. Levitt, P. and N.G. Schiller. (2004). “Conceptualizing Simultaneity: A Transnational Social Field Perspective on Society.” International Migration Review. Vol. 38, No. 3 (Fall 2004), pp. 1002-1039. Willis, P. (1977). Learning to labor. Lexington, MA: D. C. Heath. Andrea Dyrness is an Associate Professor of Educational Studies at Trinity College. She teaches courses on culture, migration and citizenship in education. Her research has explored the citizenship practices of transnational Latino communities in the United States, Central America, and most recently, Spain. Andrea holds a Ph.D. in Social & Cultural Studies in Education from the University of California, Berkeley and a B.A. in Anthropology & Educational Studies from Brown University. She has held fellowships and appointments in El Salvador, Spain, and Denmark.